(NaturalNews) This Thanksgiving, I want you to stay healthy while enjoying the celebration of abundance the holiday represents. That means knowing which Thanksgiving foods to enjoy vs. avoid, and that's what this article is all about. 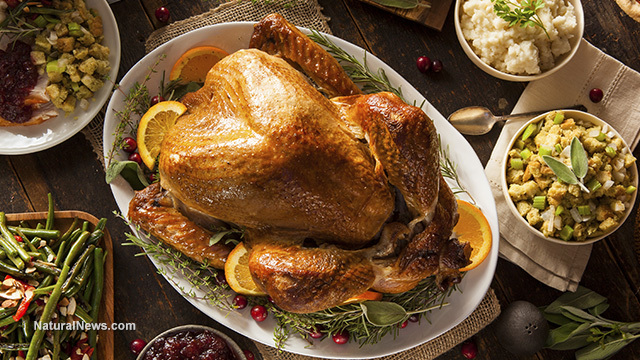 To eat in a healthy way on Thanksgiving, you don't have to be a food snob and show up to a turkey dinner with a bowl full of sprouts, but there are decisions you can make to enjoy your Thanksgiving eating while avoiding toxic food ingredients like MSG, GMOs, aspartame, chemical food colorings and chemical preservatives. Farm-fresh Thanksgiving vs. processed food "factory Thanksgiving"
In my history as a food advocate, I've been a meat eater, a vegetarian, a vegan and a Mediterranean Diet follower. I've done fasting, juicing, cleansing and low-carb. But the most important wisdom I've learned from all this that's really worth mentioning for Thanksgiving is that nearly ALL food that's organically raised on a farm and eaten fresh is GOOD for you. This includes fresh dairy, fresh eggs, fresh meats and homemade sweets made with unprocessed ingredients like honey (not sugar!) and stone-ground whole wheat flour. At the same time, nearly every food made in a factory is BAD for you. Anything that's overly refined, processed, modified, homogenized, pasteurized or fattened up with genetically modified feed is going to promote disease and obesity. Turkey gravy from a gravy mix packet, in other words, is toxic because it's almost always made with MSG and thickened with corn starch derived from genetically modified corn. But turkey gravy made from actual turkey juices and thickened with home-ground flours and organic starches is a completely different story. This is especially true if it's from a turkey that one of your family members harvested in the wild -- that's by far the most healthful turkey meat you'll ever eat, and it's far less cruel to kill a turkey with one shot than to condemn a turkey to a lifetime of being imprisoned in a turkey factory cage and fattened with hormones, chemicals and GMOs. I'm not saying you have to eat turkey to have a healthy Thanksgiving meal, of course. There are plenty of vegetarian and vegan options available to those who choose not to eat meat. But for those who do eat turkey meat, I strongly urge you to avoid the factory-produced turkey sold at grocery stores and bought by oblivious consumers who have no clue about the cruel, inhumane, unhealthy way in which factory turkeys are raised and processed. Pies can be good for you, too, if they're made from scratch and without using toxic ingredients like vegetable shortening. Shortening is a disease-promoting food ingredient. Made of cancer-causing partially hydrogenated oils, it's almost always GMO in origin and loaded with toxic trans fats, too. That's why shortening promotes cancer, heart disease and possibly even Alzheimer's. In my educated opinion, I believe it is far healthier to use either a natural plant-based fat (such as coconut oil) or genuine animal lard (from a pig raised on your farm, for example) instead of processed shortening. Although I'm not a big meat eater myself, I would far sooner eat a pie crust made with organic pig's lard than with processed GMO vegetable shortening! Of course, I would personally prefer the coconut oil or some plant-based fats if available. Nearly all pie crusts served today across America are made with toxic vegetable shortening and refined white sugar. Both of these ingredients are poisonous to human biology. Pie fillings are also toxic because they're usually made with refined white sugar. A far healthier and better replacement is palm sugar or coconut sugar, both of which are far more rich in terms of minerals while also having a far lower glycemic index than processed white sugar. Remember: Any food that's processed and white is BAD for you: white sugar, white bread, white flour, etc. Try making a raw pumpkin pie! For pumpkin and apple pies, I actually recommend making raw pies. That's right: no cooking required. The raw fruit in the pie filling is far better for you than cooked fruit. Plus, you'll receive more nutrients, more protein and more intact fibers. Here's an awesome recipe for making raw pie that's also vegan. Mashed potatoes - grow your own and mash 'em yourself! Do I even need to say that instant mashed potatoes are less than ideal for your health? You're far better off to buy whole potatoes (or grow your own if you've got some dirt) and mash 'em yourself. Importantly, mashed potatoes should include the potato skins. That's the only healthy part of the potato, of course, and it's silly that most people peel the skin off and throw it away. Even worse, most people don't have backyard chickens to throw the skins to! They toss them into the garbage! Geesh, if you're going to peel the potatoes, at least compost the skins into soil and use that soil to grow more potatoes. Please don't eat breads and rolls made from processed white flour. Throwing some processed bread materials into an oven does not count as home cooking, either. Real home cooking means you make the dough, and you'd be smart to make the dough from wholesome, organic ingredients that are minimally processed. Store-bought stuffing, by the way, is usually laced with MSG or similar excitotoxins like yeast extract or hydrolyzed vegetable protein. Most gravy mixes are also laced with MSG which is why so many people get headaches and migraines after eating a Thanksgiving meal. If you eat stuffing, make sure it's truly homemade and not from a factory food box. That rule, of course, applies to everything you eat at Thanksgiving. Green beans, corn and beets are all very healthy vegetables when grown organically and non-GMO. But watch out for GMO corn and even genetically modified beets. (Green beans, thankfully, aren't yet GMO). If you do eat greens of any kind, try to make sure your family members didn't cook the life out of them. For some reason, "pioneer cooking" in America seems to require that you cook every vegetable into a lifeless mass. This is not the proper way to preserve the nutrition found in vegetables. Green beans, for example, should remain somewhat crispy, and it's far healthier to stir-fry them quickly in a wok rather than boil them to death in a pot of water (and most people toss out the water, which is where a lot of the nutrients go). The best way to ensure the health properties of your veggies and fruits is to buy organic, unprocessed foods and expose them to minimal heat during cooking. Nearly all fruits should be eaten raw, by the way, as heat quickly destroys most of their valuable medicinal nutrients. Nearly all sweets you'll find at Thanksgiving are made with toxic hydrogenated oils (shortening) and refined white sugar. For this reason, they should all be avoided. Healthy sweets must be made with natural oils and full-spectrum sweeteners such as honey or palm sugar. Don't be fooled by "brown sugar" sold at grocery stores -- it's just white sugar that's processed into a brown color with a slightly different taste profile. Raw foodies know that the best tasting and most healthful treats are made from things like nuts and date paste. You can make delicious cookies, cakes and other treats with date paste as the base, adding in other ingredients like coconut flour to give it more bulk. Coconut flakes and shreds are also ideal for this purpose. I think Trader Joe's still sells coconut date rolls, in fact, and they're actually a very healthy treat. In all, remember that you have total control over what you decide to eat. Even during a holiday food extravaganza like Thanksgiving, you can still make intelligent, informed decisions to eat in a more healthful way. There is no need whatsoever to punish yourself with toxic food ingredients like hydrogenated oils, MSG, aspartame, GMOs, artificial food coloring and factory-raised meats. If you're going to celebrate abundance, why not celebrate with healthful food choices that enhance your long-term enjoyment of life instead of contributing to diabetes, cancer, heart disease and obesity?